Michael Brenner’s Marketing Insider Group is aptly named. The firm works with clients on everything from content strategies to buyer journeys, but what it does best is to look at the “guts” of an organization to help them figure out how to solve real customer problems. It’s through this deep evaluation of how a business works that Michael and his team help their clients help their customers. Michael is a globally-recognized keynote speaker on leadership, culture, and marketing. Author of the bestselling book The Content Formula, Michael’s work has been featured by The Economist, The Guardian, and Entrepreneur Magazine. In 2017, Michael was named a Top Business Speaker by The Huffington Post and a top CMO Influencer by Forbes. Today, he shares insights in our Human Touch Spotlight from his 20+ year sales & marketing career. His work as an executive inside huge organizations like Nielsen, SAP (where, as a client, he got to know Televerde) and Newscred has influenced the work he and his team do at Marketing Insider Group. I got to know Michael when I participated on a panel he moderated at an industry conference. As a longtime friend of Televerde from his days at SAP, Michael shared with me what excites him about today’s marketing scene, his commitment to helping leaders champion their teams in order to get to massive growth and even his own business mantra for success. Ray: Hi, Michael. I appreciate you sharing your thoughts in this edition of The Human Touch Spotlight. You’ve worked in both the sales & marketing disciplines and inside technology companies. We’d love your opinion on where you see the balance between people and technology? Michael: Marketing has always been about people. The most effective marketing is human and emotional. But technology has enabled us to understand our buyers better, to move from mass communications to targeting our marketing to individuals, to investing in the most effective marketing programs, and to measuring and communicating our results. Tell us – what has you really excited about marketing and sales right now? Employee Activation! According to LinkedIn, just 3% of employees generate 30% of all the clicks on brand-produced content. Employees have on average 10x the connections of their companies. And the ability to reach those connection costs nothing. Leaders need to encourage their employees to share what they know and what they are passionate about on brand-owned platforms. This is proven to generate leads for marketing, deals for sales, an engaged workforce for HR, and happy executives. What a great point Michael. We’ve seen companies striving to activate their employee base for reach and demand generation as well. Shifting gears a little, outside of Twitter and LinkedIn, what other social media networks should B2B marketers utilize? I see a lot of B2B Marketers using Facebook. Those are the big 3. I don’t see any reason for a B2B brand to spend money on Snapchat or Instagram. If you want to have some fun and build an audience, maybe for Talent and Recruitment, OK. But for leads, LinkedIn, Facebook, Twitter. Probably in that order for most. You’ve made a very successful transition from corporate life to entrepreneur. What business practices do you swear by and why have they proven to be critical for your business? Shakespeare said that nothing is more valuable than your reputation. So I try to be honest, helpful, personable, approachable and even professional despite my genuinely goofy nature. And while there are times when that is appropriate, it is only when someone asks you those questions. EVERY OTHER TIME, you should be 100% focused on helping people. I read a recent LinkedIn post you wrote about making the marketing discipline disruptive. Do you have tips for helping CMOs and their teams do just that? Marketing needs to help the CEO create a culture focused on customer experiences. Product differentiates no company. Anyone can re-create your product in no time. Logos and colors and fonts differentiate no company. Anyone can buy ads and clicks. Engagement is the key in the digital world. The one thing we can control is the experience your buyers have across the sum total of touch points with your business. That’s what differentiates you. Your firm, Marketing Insider Group, focuses on helping companies reach, engage and convert new customers. Sales & Marketing really have to be aligned to make that work. What are your best tips for aligning these two critical groups (sales & marketing)? I started my career in sales and moved into marketing because I was frustrated by Marketing throwing leads over the wall. As a marketer, my first meeting was always with the head of sales. We have to communicate about the natural tendency for sales to want really qualified leads at the end of the quarter. And high volumes of leads at the beginning. Marketing MUST resist the tendency to throw sales unqualified leads at any time. An inquiry is not a lead. Marketing needs to nurture until the point that a sales signal is thrown off (or predicted) and then send to sales. Thank you so much for sharing your insights with us. I’m curious to know if you have a mantra or code? Life is short. 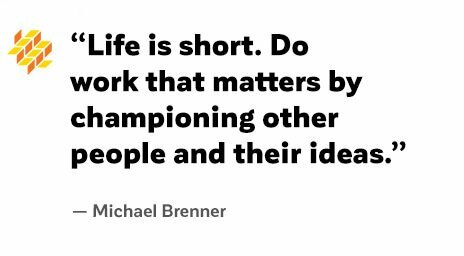 Do work that matters by championing other people and their ideas. Check out our other interviews on The Human Touch Spotlight. Who should we interview next? Email me with your suggestions!